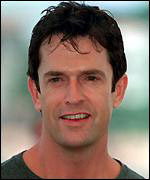 In 1997 Rupert Everett became a certified film star by playing a supporting role as Julia Roberts ' gay chum in the overrated US comedy, My Best Friend's Wedding (d. P.J.Hogan), which brought him several awards, including a BAFTA. Interviews confirmed his gay identity and his refusal to hide it in a Hollywood usually nervous on this matter. Born in Norfolk on 29 May 1959 to wealthy parents, educated at Ampleforth College and, after a self-confessed stint as a prostitute, trained for the stage at Central School , he had West End success in Another Country (1982), as a young Guy Burgess type, repeating the role on film (d. Marek Kanievska, 1984). Between that and his late 1990s réclame, he made some curious choices, the most interesting of which were the moody, Venice-set sexual drama, The Comfort of Strangers (UK/Italy, d. Paul Schrader, 1990) and as the indolent, waspish Prince of Wales in The Madness of King George (UK/US, d.Nicholas Hytner, 1994). None of his international films was a popular success (including Robert Altman's Prêt-à-Porter , 1994): some, indeed, were scarcely seen: then, with Shakespeare in Love (UK/US, d. John Madden, 1998, as Marlowe ), An Ideal Husband (UK/US, d. Oliver Parker, 1999, as a languid Lord Goring) and A Midsummer Night's Dream (UK/Italy, d. Michael Hoffmann, 1999), it was hard to avoid him, and not many wanted to. He has been nominated for - and often won - awards across a wide spectrum of prestige, and seems to have become a cult favourite.